Every year, several universities in the United States are selected by the Phi Beta Kappa Visiting Scholars Program to host a speaker of national distinction at their site by offering presentations and colloquiums to students and faculty. This year, UNCG was selected as one of those schools. Prof. David Schmidtz, founding director of the Center for the Philosophy of Freedom and Kendrick Professor of Philosophy at the University of Arizona, will visit campus Feb. 23 and 24. 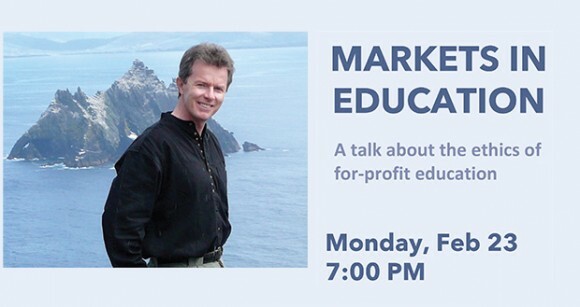 On Monday evening (2/23), there will be a talk on “Markets in Education” that is open to the public at 7 p.m. in Room 136, Petty Building. Schmidtz is co-authoring a book on the ethics of for-profit education and he will be presenting on this topic. The public is invited to attend. Schmidtz teaches Philosophy and Economics at the University of Arizona and holds a courtesy appointment at the McGuire Center for Entrepreneurship at Eller College of Management. He works in ethics, environmental philosophy, and rational choice. He is also the editor-in-chief of Social Philosophy and Policy and co-editor of Environmental Ethics: What Really Matters, What Really Works. He is the author of Rational Choice and Moral Agency; Elements of Justice; and Person, Polis, Planet. His first book, The Limits of Government: An Essay on the Public Goods Argument combined his interests in moral philosophy and economic analysis. As director of the Freedom Center, his mission is to promote understanding and appreciation of the ideals of freedom and responsibility along four dimensions: published research, undergraduate education, graduate education, and community outreach. Through his exceptional research, founding and directing the Arizona Freedom Center, and as editor-in- chief of the Social Philosophy and Policy journal, Schmidtz has been the driving force behind UArizona now being ranked #1 in the world for political philosophy. For more information about any of these events, contact Bas van der Vossen at b_vande2@uncg.edu or the Philosophy Department at 334-5059.